30,000 signed and numbered undeveloped blueprints. 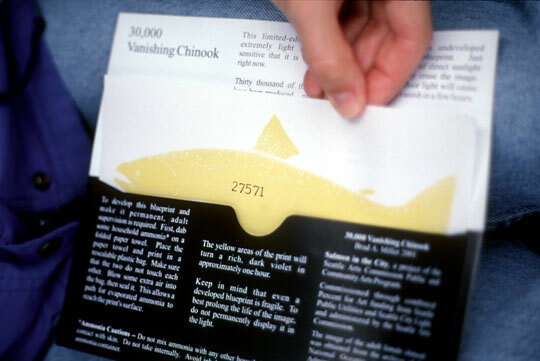 Yellow image of a Chinook Salmon disappears in light, emphasizing the fragility of this and other endangered species. Prints were handed out by Seattle Public Utilities in all areas of Seattle. Recipients were encouraged to keep their hands and eyes off of these prints, or risk loosing the Vanishing Chinook entrusted to their care.